Whoever wants to be saved should above all cling to the catholic faith. Whoever does not guard it whole and inviolable will doubtless perish eternally. 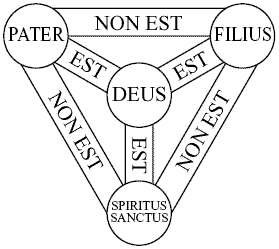 Now this is the catholic faith: We worship one God in trinity and the Trinity in unity, neither confusing the persons nor dividing the divine being. For the Father is one person, the Son is another, and the Spirit is still another. But the deity of the Father, Son, and Holy Spirit is one, equal in glory, coeternal in majesty. What the Father is, the Son is, and so is the Holy Spirit. Uncreated is the Father; uncreated is the Son; uncreated is the Spirit. The Father is infinite; the Son is infinite; the Holy spirit is infinite. Eternal is the Father; eternal is the Son; eternal is the Spirit: And yet there are not three eternal beings, but one who is eternal; as there are not three uncreated and unlimited beings, but one who is uncreated and unlimited. Almighty is the Father; almighty is the Son; almighty is the Spirit: And yet there are not three almighty beings, but one who is almighty. Thus the Father is God; the Son is God; the Holy Spirit is God: And yet there are not three gods, but one God. Thus the Father is Lord; the Son is Lord; the Holy Spirit is Lord: And yet there are not three lords, but one Lord. As Christian truth compels us to acknowledge each distinct person as God and Lord, so catholic religion forbids us to say that there are three gods or lords. The Father was neither made nor created nor begotten; the Son was neither made nor created, but was alone begotten of the Father; the Spirit was neither made nor created, but is proceeding from the Father and the Son. Thus there is one Father, not three fathers; one Son, not three sons; one Holy Spirit, not three spirits. And in this Trinity, no one is before or after, greater or less than the other; but all three persons are in themselves, coeternal and coequal; and so we must worship the Trinity in unity and the one God in three persons. Whoever wants to be saved should think thus about the Trinity. It is necessary for eternal salvation that one also faithfully believe that our Lord Jesus Christ became flesh. For this is the true faith that we believe and confess: That our Lord Jesus Christ, God’s Son, is both God and man. He is God, begotten before all worlds from the being of the Father, and he is man, born in the world from the being of his mother-existing fully as God, and fully as man with a rational soul and a human body; equal to the Father in divinity, subordinate to the Father in humanity. Although he is God and man, he is not divided, but is one Christ. He is united because God has taen humanity into himself; he does not transform deity into humanity. He is completely one in the unity of his person, without confusing his natures. For as the rational soul and body are one person, so the one Christ is God and man. He suffered death for our salvation. He descended into hell and rose again from the dead. At his coming all people shall rise bodily to give an account of their own deeds. Those who have done good will enter eternal life, those who have done evil will enter eternal fire. One cannot be saved without believing this firmly and faithfully.